In writing a work like this and researching a "main character" in Nicholas Trammell, I could not help but want to know more about him. Every tidbit of information I uncovered seemed to lead to a whole host of new questions. So when a Trammell descendant said she had a picture of him I was incredibly excited. This is the photo I received. Trammell is often reported to have "surveyed" Trammel's Trace so I can understand the connection to the equipment. Even through I've found no evidence of him being an actual surveyor, that bit of historical overreach is carried on some Texas historical markers. I've learned to investigate facts so I reached out via email to some members of the Surveyor's Historical Society to ask for their assessment of the equipment shown in the hopes it would establish a date for the photo. What I got back was detailed and incredibly complete. These folks know their stuff. They told me very quickly that this is a photo from the Library of Congress (click here) with the date 1851 written on the back. In 1851 Trammell was 71 years old. So this is likely not Nicholas Trammel, unfortunately. I hate disappointing family members, but I do like learning the facts. So what DID Nicholas Trammell look like? The illustration and text below are one of the few first hand descriptions of any aspect of Trammell personally. A couple of things about this observation. At the time Trammell would have been 66 years old, so he must have been remarkably healthy to have been mistaken for a younger man. The soldier also noted that though Trammell "would perform with fidelity and honor, whatever he undertook, but it was prudent to watch him after he completed his assignment." Like a guest who would steal your silverware at the end of the meal. 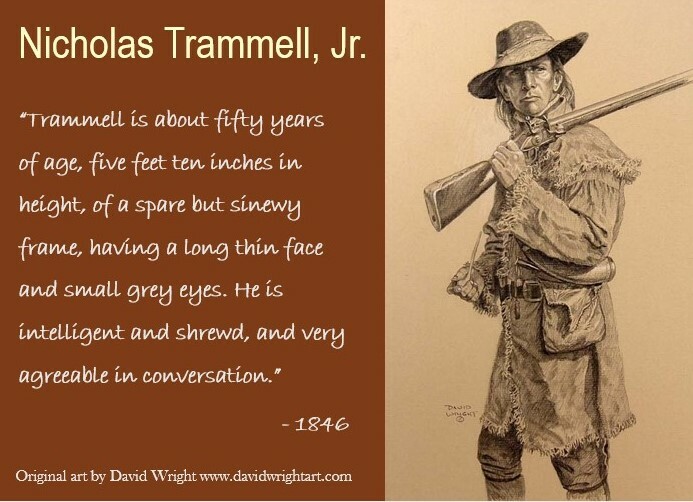 Better than any other source I have found, Wright's illustration gives us an image where we can hang our hat of imagination on a depiction that matches a much younger version of the soldier's physical description of Trammell. Mr. Wright is meticulous in his research. He was an adviser in selecting the clothing and arms for the Sam Houston sculpture recently erected in Maryville, Tennessee. As a result he pointed out for me that this clothing is in the date range of the War of 1812, not the time frame of the soldier's quote. That is even better in my mind because now we can envision what Nicholas Trammell looked like around the time he was accused by the Cherokee in Missouri Territory of stealing their horses. Both the dress and the physical description of the soldier match this artwork incredibly well. So for me, this is how I visualize Nicholas Trammell. Now if one of the Trammell descendants can help me find his headstone somewhere in Gonzales County, Texas I will be packed and in my truck in under 42 minutes. Road trip!! !